Bulgarian archeologists have unearthed a 2,500-year-old gold mask believed to image the face of an ancient Thracian king. The find of such an artifact is unrivalled in the study of classical antiquity, according to Georgi Kitov, head of the excavations expedition which is researching the inside of a Thracian tomb located near the village of Shipka, about 200 km east of Sofia. The gold mask is believed to depict King Seutus III, a 5th century BC leader of the Thracians, the dispersed tribes who once lived in parts of what is now modern-day Bulgaria, Romania, Macedonia, Turkey and Greece. According to Georgi Kitov the mask "has no comparison in the world" and it can prove even more significant discovery than the mask of King Agamemnon, the Greek hero described by Homer in the Iliad. It's one of the most famous images of Greek antiquity, and the centrepiece of the National Archaeological Museum in Athens.The Mask of Agamemnon, a centerpiece exhibit in the National Archeological Museum in Athens, was made of gold foil and weighs only 60 grams, while the Thracian royal mask weighs 690 grams and is of solid gold.In addition, the archeologists also found a golden ring, apparently portraying an Olympic rower, as well as many bronze and silver vessels. The burial place was covered with six stone slabs, each weighing at least two tonnes. The king's remains have not yet been found, but excavations at the tomb continue, Kitov said.Dozens of Thracian mounds are spread throughout this region, dubbed "the Bulgarian valley of kings" in reference to the Valley of Kings near Luxor, which is home to the tombs of Egyptian Pharaohs. The Thracian tribes lived on the fringes of the Greek and Roman civilizations, often mixing and clashing with the more advanced cultures until they were absorbed around 45 AD. Do you think that the burial mask of Seutus III could replace Agamemnon's? Even when I was young and now, I remember that in most of the books that were talking of the Antiquity and that I have seen, there was always a picture of Agamemnon's mask, it is one of the symbols of antiquity. Personnaly, I don't think so because although Seutus is weights 630 g. more, Agamemnon's is 1000 years older then the Thracian mask and not only that, but Agamemnon is a far more popular character in world history then Seutus III. 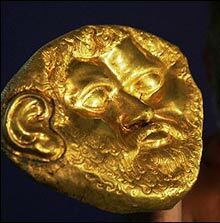 Re: Could Agamemnon's mask be replaced? Already a month after the discovery and many international museums from Japan, France, Spain and UK are eager to see the Ancient Gold mask. The mask is exhibited in the Bulgarian Archeological Museum in Sofia until the 22nd of September, when the restavration process will be started. After some preliminary estimations the value of the golden artifact is established as much as 50 million euros. I forget who found the "mask of Agamemnon" (Evans, Schliemann?) but wasn't this mask later found to date to another period? I believe Heinrich Schliemann discovered the mask in 1876-78, he misnamed it Agamemnon's Mask, because later on a group of archeologists established the fact that the mask was older than it was thought and that it belonged to an earlier unknown monarch, but the name was kept.